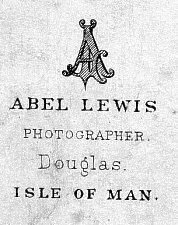 Abel Lewis was one of the earliest photographers working in Douglas from c. 1862 to 1885. 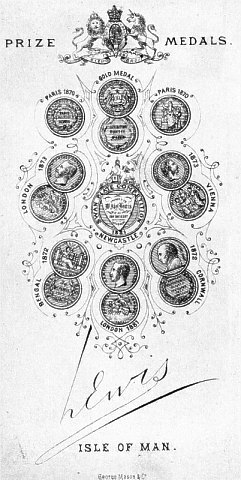 The designs on the reverse of the cartes de visite reflect his growing collection of awards and can thus be used to provide an approximate date. He also appeared to use different colour backs, this too may provide some indication of date, though this aspect is still to be researched. 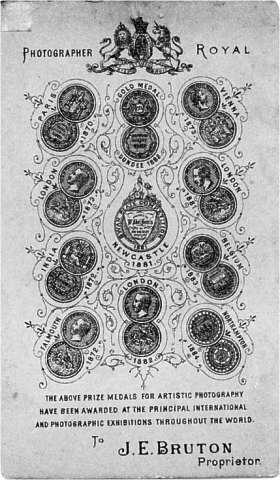 The earliest dated card I have is dated 1867 and has no medals just an ornate set of Initials printed within an ornate frame. 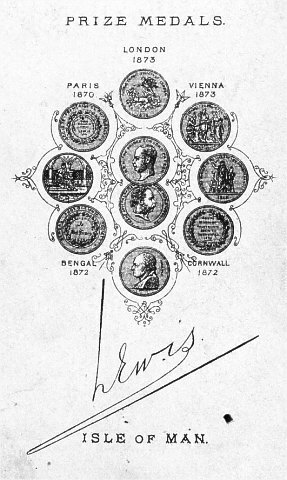 This card also has an imprint on the front - "Lewis Photo Douglas"
I have one card with this back which is noted on the back 'taken about 1873' which may be a misrecollection as the medal backs appear to date 1871 onwards though I do have an undated card with just the signature and no medals with the "Abel Lewis Photo Douglas" imprint. 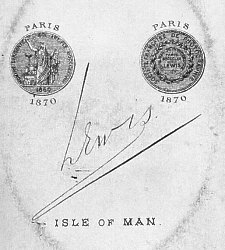 A card dating post 1870 shows the 1870 Paris medal and a signature. 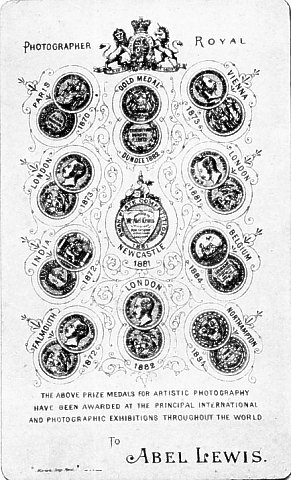 The imprint on the front now reads "Abel Lewis Photo Douglas"
front imprint "Abel Lewis Douglas Isle of Man"
The medals are the same as before but the Royal Arms are narrower - this back was used by J.E.Bruton when he took over the studio after 1885 using the front imprint of "Abel Lewis Studio Douglas"